Blizzard has begun new card reveals for Hearthstone's next expansion. Kobolds & Catacombs will introduce 135 new cards, utilizing a new Recruit mechanic and introducing a new Dungeon Run single-player adventure. It'll mark Hearthstone's seventh expansion and will be the final one issued in the Year of the Mammoth. Taunt. Deathrattle: Recruit 2 minions that cost (4) or less. 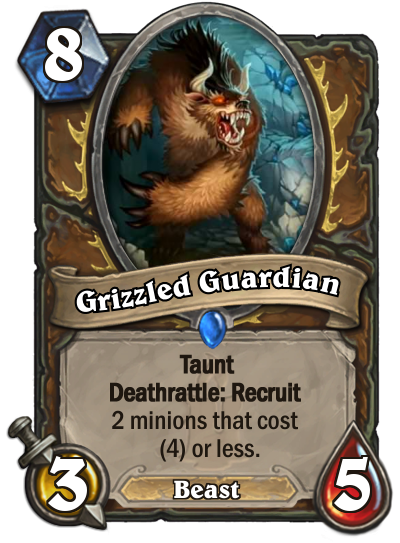 Analysis: Grizzled Guardian is an awfully expensive 3/5 for Druid players and it's not one I'm expecting to see get a lot of action. If any minion costs this much and boasts these kinds of stats, it had better have one good effect. Unfortunately, this does not. There are few minions that costs 4 or less that would make playing this minion worthwhile. Even with Beast synergy going for it, it's hard to imagine Druid players willingly packing this into a deck or Arena players drafting it. Its ceiling is a half-decent Discover option, but nothing better than that. Battlecry: Swap decks with your opponent. Give them a Ransom spell to swap back. Swap decks with your opponent. 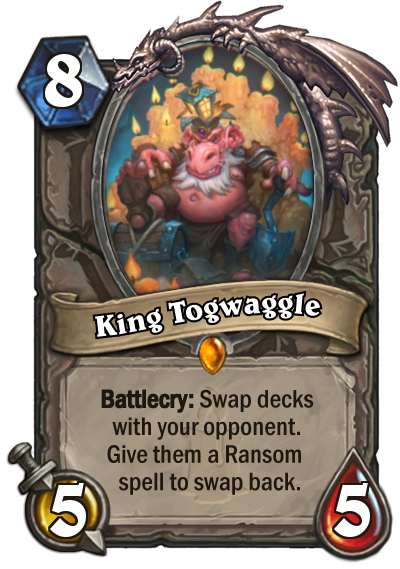 Analysis: I'm going to admit, I'm left scratching my head a bit by King Togwaggle. The idea of swapping decks is interesting, but the excitement is slightly tempered when I see that the opponent gets another 5-mana King's Ransom to swap decks right back to where they were. So then what can someone do in such a situation? How would this work? The idea would be to swap decks with the opponent and then slap down Explore Un'Goro to turn all of those cards into 1-mana copies of "Discover a card." If the opponent uses the King's Ransom, use Skulking Geist to immediately wipe out their entire hand and deck. That sounds sick and it's sure going to be hilarious when somebody inevitably falls into that trap. 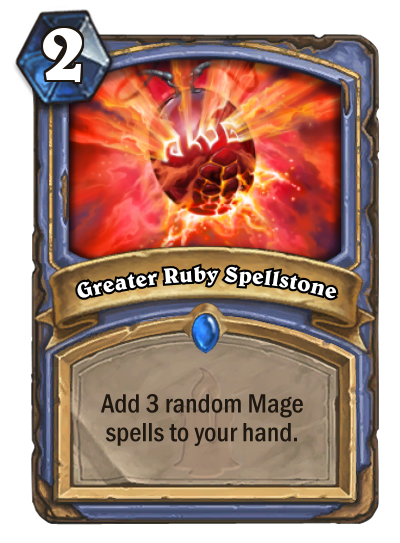 Add 3 random Mage spells to your hand. Analysis: What's a Quest Mage to do when Cabalist's Tome is just months away from rotating out of Standard? Get an even better Cabalist's Tome, of course! 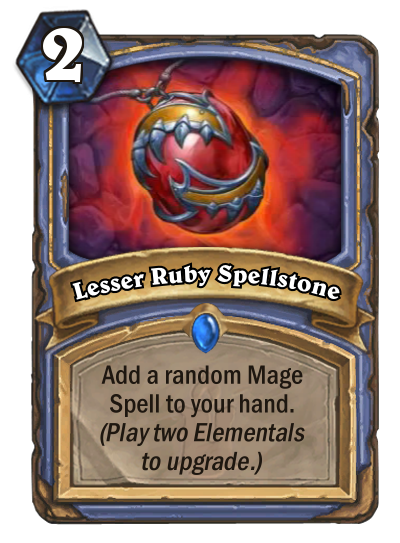 The Mage's new Ruby Spellstone can be upgraded into a full-blown 2-mana Cabalist's Tome, which is sure to help that Open the Waygate quest along. Upgrading it is fairly simple, since Shimmering Tempest and Steam Surger will provide Elementals at a reasonable pace. 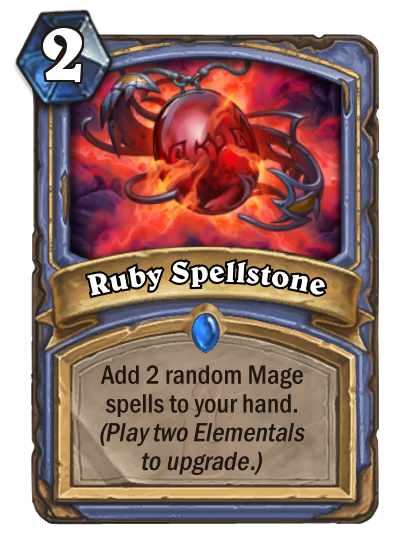 This should also help the Elemental Mage with some late-game firepower, offering up handy spells to go along with Frost Lich Jaina's life-siphoning Elementals. 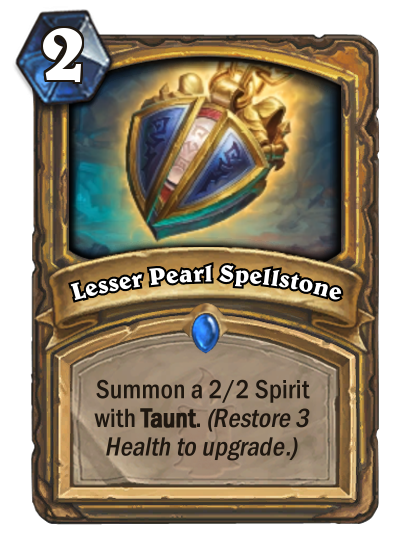 This spell is definitely a winner in its upgraded form and will likely only see action in that upgraded form. 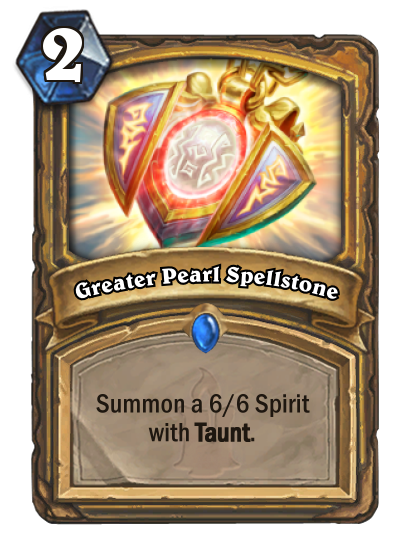 Analysis: The Pearl Spellstone isn't bad for the Paladin player looking to lay down something big in the late game for cheap. But what makes this work particularly well is that it's basically useful in pretty much every phase of the game. If you realize out of the gate that the opponent is going aggro, the 2/2 and 4/4 Taunts from the early forms of this spell will suffice just as well as anything else. 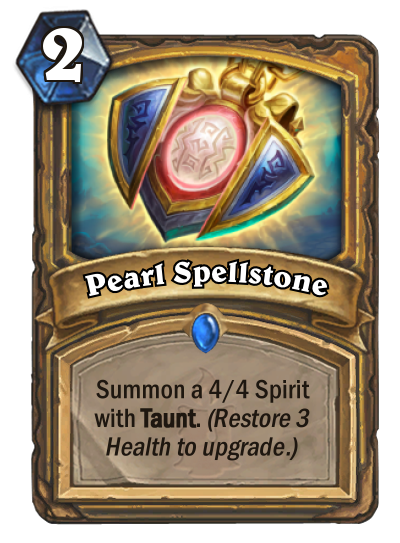 Paladin also has plenty of tools to upgrade the Pearl Spellstone. The Benevolent Djinn revealed earlier will work nicely, offering a 3 Health heal in one shot. A quick rush from Chillblade Champion will do the same. Ivory Knight can help here, too, while also picking up something like Spikeridged Steed to maybe buff up that 6/6 Taunt a little further. This is a strong spell for Paladin and one that will likely find a home in a lot of decks. Analysis: Look at the Mage, making a total mockery out of Snipe. Hey, Hunter, you call that a Secret? This is a Secret! For most of Hearthstone's existence, the surest way around a Secret like Mirror Entity was to play a low-value minion and force it out. This specifically penalizes that idea by not only wiping that minion out, but also hitting the opponent for excess damage. This is a downright dangerous spell and is definitely going to become a staple of Secret Mage decks. Playing against Secret Mages is already unpredictable, but Explosive Runes makes the matchup even hairier now. I'd even go so far as to say it'll help propel Secret Mage near the top of the upcoming meta. 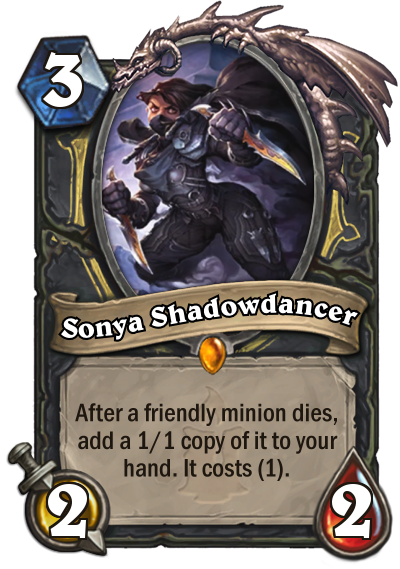 Analysis: I'm approaching Sonya Shadowdancer with the idea that the Rogue can trade in minions to trigger her effect. If that's the case, Sonya will become a Rogue staple and could potentially bring the Quest Rogue back from the dead. Filling the quest's requirement should take little effort and the parade of 5/5 minions should begin in short order. Miracle Rogue will find good use for this minion, as well, taking full advantage of having multiple copies of Edwin VanCleef, Questing Adventurer, and Vilespine Slayer. There's even the potential to get greedy by playing around with Shadowcaster. That's all assuming, of course, that Sonya's effect works by trading minions in. If the effect only triggers when the opponent destroys a minion, then feel free to disregard all of the above. Whenever you cast a spell, gain Armor equal to its Cost. Analysis: It's hard to imagine anything other than Mana Wyrm as the Mage's go-to Turn 1 play. But man, Arcane Artificer is a great opening play and has every potential to be just as good. While Mana Wyrm will work as an offensive play, Arcane Artificer works for defensive-minded Mages. Its Elemental synergy makes it a no-brainer for Elemental Mages. Freeze and Quest Mages will love its ability to armor up as they prepare their win conditions. Its effect makes it a valuable anti-aggro minion, as well as a godsend for the later stages. Dropping this guy and a Flamestrike in the later turns would potentially clear the board and protect for 7 Armor, which is insane. 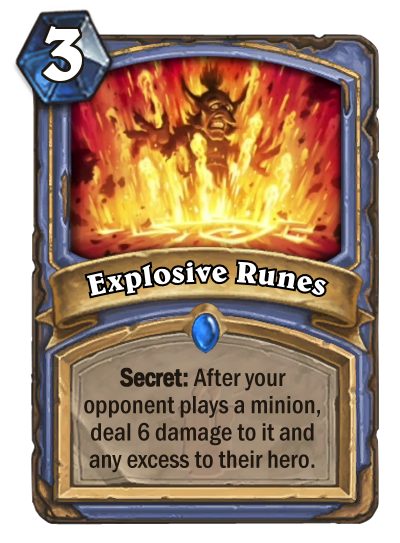 The only Mage that might not find a lot of use out of this would be Secret Mage, since its style would work better with Mana Wyrm's offensive firepower. 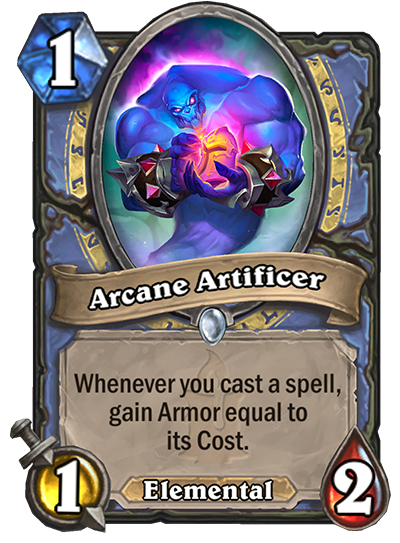 But aside from that, Arcane Artificer is a big winner and will see a lot of play in the new meta. Analysis: Oh man, this was so close to being a potential sleeper hit. But this is a case where reading and understanding the card's text is important. 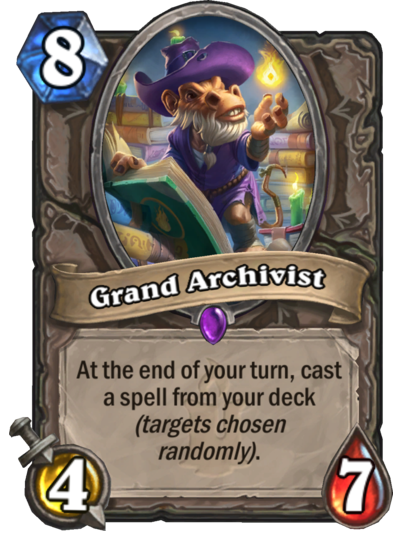 Grand Archivist will cast a spell from your deck, not a copy of a spell, but the spell itself. That makes Grand Archivist a dud. If it pulled out a copy of a spell, I could justify throwing it into Mage decks with area of effect spells like Flamestrike and Blizzard. And while that's still entirely possible to do, it's a lot less fun when it comes out of your deck. That makes Grand Archivist too much of a tough sell and not worth the risk. Analysis: This is a strong card for Elemental Mages that are looking to cast some pricey spells. Clearing the board with Flamestrike or Blizzard and setting the table for another Elemental play (like Servant of Kalimos or Steam Surger) on the next turn is solid. But even without Elemental synergy, Arcane Tyrant is a fine play for a lot of classes. Board-clearing plays like the Warlock's Twisting Nether, the Warrior's Brawl, or the Priest's Dragonfire Potion can immediately be followed by a free Arcane Tyrant to help get the edge on board presence. Ramp Druid can also use this as a nice follow-up for Nourish. 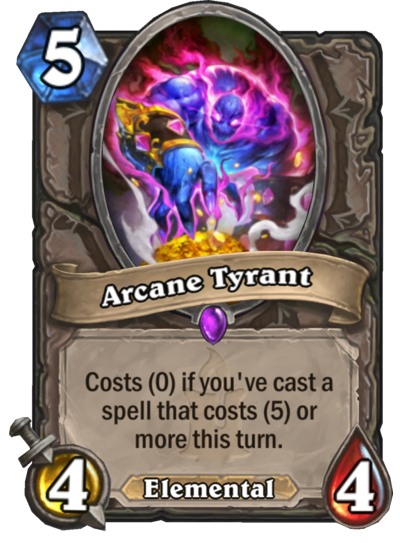 Arcane Tyrant will have its uses in constructed play, but I also expect it to be a higher-tier Arena pick. Shuffle all minions in your opponent's deck. Analysis: We conclude today's analyses just like we concluded yesterday's analyses... with another bonkers Priest card. Look at this thing! It's a complete board clear that doesn't set off any Deathrattles and undoes any stat buffs. 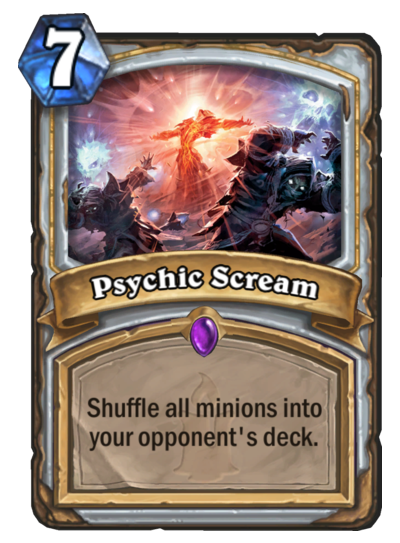 It's easily the Priest's best area-of-effect card since Lightbomb and will prove as one of the class' most reliable weapons moving forward. HOWEVER, this thing is not to be used clumsily. Read the text and observe that it will shuffle all minions into your opponent's deck. 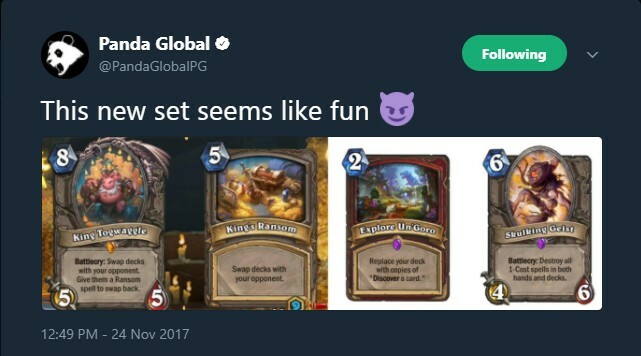 That means it will also shuffle your minions that might be in play into their deck! So don't accidentally give the opposition a crazy powerful minion that they might be able to use against you later. With that warning out of the way, this is going to ruin a lot of people's days, including Demon Warlocks, Jade Druids, Evolve Shamans, and especially Buffadins. Yes, the opponent might eventually be able to re-draw those minions, but by then, a good Highlander Priest will already have the game wrapped up. This thing's just a beast and it's probably the best card of the expansion so far. The card reveals are underway, so keep visiting Shacknews for more card analyses. We'll also be breaking down the Legendary weapons individually in the coming days. Hearthstone's Kobolds & Catacombs expansion is set to release on December 7.